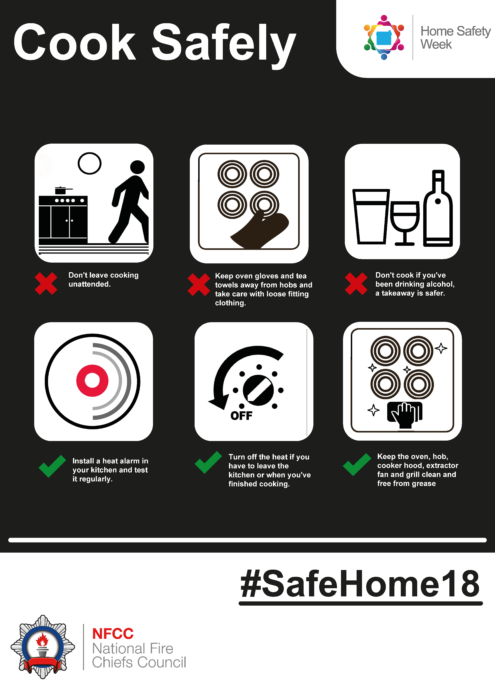 Smoke alarms to escape routes - essential advice from the Fire Service. The National Fire Chiefs Council is working with local fire and rescue services to highlight the importance of fire detection in the home. Alarms can’t prevent fires but they do provide an early warning of fire, buying you valuable time to get out of the house. Even if you think you’ve got sufficient alarms installed it’s worth taking time to double check as the advice and your personal circumstances may well have changed since you installed your alarms. Most of us are now quite familiar with smoke alarms but it’s worth checking that your alarms are up to scratch. Double check your alarms are correctly fitted. They should be screwed into place on the ceiling – ideally in the centre of the room. Make sure you have the right alarm in the right place. If your alarm is activated when cooking or taking a shower then you should install the alarm further away from the kitchen or bathroom. One alarm is not enough. Your home should have at least one alarm on each level. We recommend you also install smoke alarms in rooms you use the most as this is where fires are most likely to start. If your alarms are more than ten years old – replace them. Alarms should be tested regularly – If you cannot reach them, ask for help to push the button, avoid climbing on chairs or furniture you could injure yourself if you fall. If you use Telecare, your alarms should be linked to your Telecare system. Most fires in the home start in the kitchen. 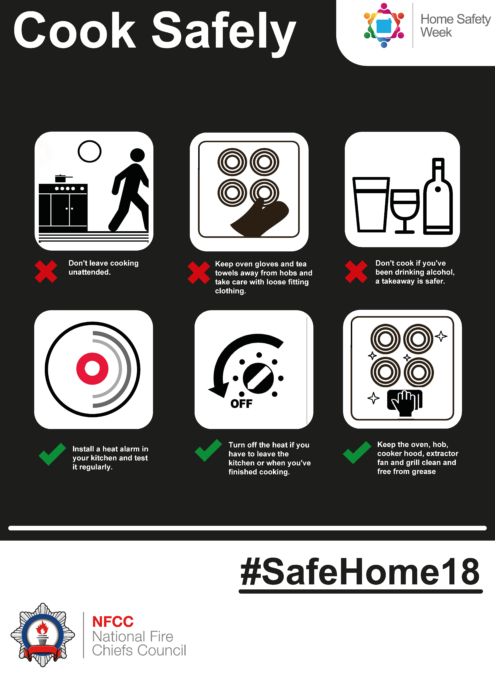 Smoke alarms cannot be installed in the kitchen as steam and fumes from cooking will activate them. The best type of alarm for a kitchen is a heat alarm. They are not sensitive to smoke and activate when there is a rapid increase in temperature or a very high temperature. Take care if you’re wearing loose clothing – it can catch fire so be sure not to lean over hot hobs or gas flames. Don’t get distracted or forget about your cooking – set a timer to remind you. Think about how you would leave the house in an emergency Usually the best route out is the normal way you would leave your home but consider what you might do it this route was not available to take. Keep your home clutter free. Make sure you can easily move around. Don’t keep items on the stairs, they can cause an accident at the best of times. Make sure any exits are clear. Even if it’s an exit your household tends not to use on a daily basis, in an emergency it might be the only escape route. Can the Fire Service help you? People’s lifestyle or circumstances may mean the Fire Service would consider them more at risk of having a fire. Factors such as smoking and hoarding, evidence of previous fires or near incidents of previous fires may mean someone is considered more vulnerable. Do any of the following apply to you or someone you know? Reduced ability to react which could be due to not having smoke alarms or the appropriate smoke alarms installed, substance dependency, mental health conditions or learning difficulties. If you or someone you know may need some extra help in assessing and addressing the fire risk in their home then we urge you to get in touch with your local fire and rescue service. The services they offer vary from area to area but they can offer general advice or Home Safety Visits which can advise you on fire prevention, detection (they may install smoke alarms if needed) and what to do in the event of a fire, or even a Safe and Well visit. The Safe and Well visit covers wider health and wellbeing issues and can signpost people for further help.